Following a somewhat problematic initial release of iOS, Apple pushed out iOS 11.0.2 to fix a number of issues. But people are already looking forward to the next incremental, non-bug-fixing release. This is iOS 11.1, and Apple has revealed a little of what we can expect. iPad and iPhone users are to be treated to a new batch of emoji -- hundreds of new ones in total -- encompassing "more emotive smiley faces, gender-neutral characters, clothing options, food types, animals, mythical creatures and more." While the official release of iOS 11.1 is a little further down the line, developers and users of the iOS public beta will be able to get hands-on with the new emoji starting next week. Apple says the emoji will also be making their way to watchOS and macOS at some point. 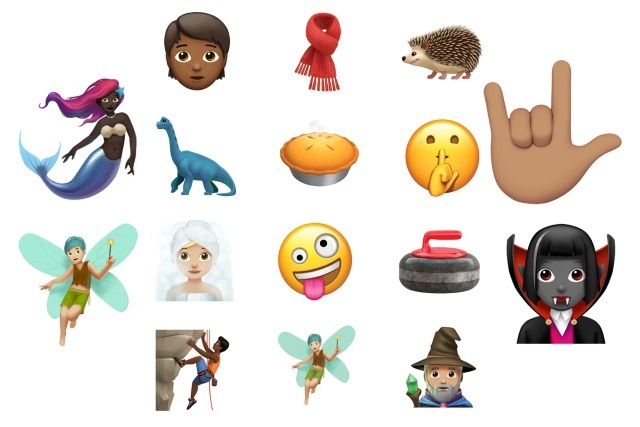 The new emoji are designed to reveal every detail and adapted from approved characters in Unicode 10. iOS 11.1 will also include characters announced on World Emoji Day like Woman with Headscarf, Bearded Person, Breastfeeding, Zombie, Person in Lotus Position and new food items such as Sandwich and Coconut. Also included in the update is the Love-You Gesture, designed after the "I love you" hand sign in American Sign Language. While American Sign Language users will undoubtedly be pleased to see the arrival of a hand sign emoji, it's hard to imagine that that particular emoji won't be confused for metal horns!